Island foxes are making a strong recovery across the Channel Islands, but the need to monitor their populations continues. This past year, in 2013, three radio-collared island foxes were killed by golden eagle predation. 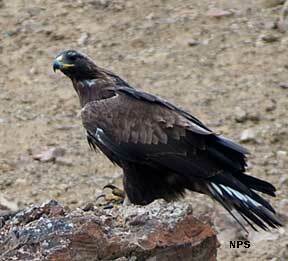 Two foxes were killed by a golden eagle on San Miguel Island and one on Santa Cruz Island. Biologists do not know if the island foxes were killed by the same golden eagle or by two different golden eagles. The distance between the islands can be easily managed by a single large eagle. However, in the past, golden eagles have often preyed on island foxes in a specific area when they have been successful. 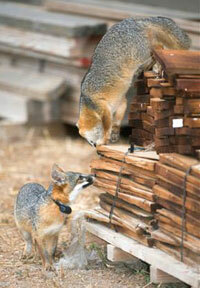 As the populations of island foxes have increased, the cost of radio-collaring all adults has become prohibitive. Radio-tracking collars now cost $300 each. A representative number of island foxes are radio-collared on each island–approximately 5% to 11% of individual island foxes on each of the northern islands. For each radio-collared island fox killed by a golden eagle, there is the possibility of several non-collared foxes being impacted as well. Island foxes are well camouflaged for their habitat. When an island fox without a radio collar is killed by a golden eagle it is difficult to know the incident happened, little alone to find the fox's remains. 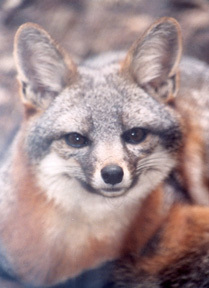 Radio-tracking collars are the island foxes' best defense against unexpected threats. To-date Friends of the Island Fox supporters have funded 96 radio collars. 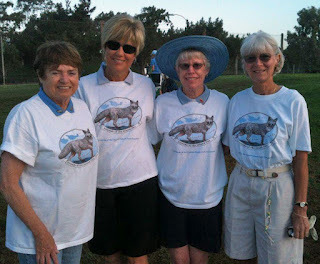 $300 Helps protect island foxes. Who has funded radio-tracking collars? Join with other people to help fund radio collars for island foxes.